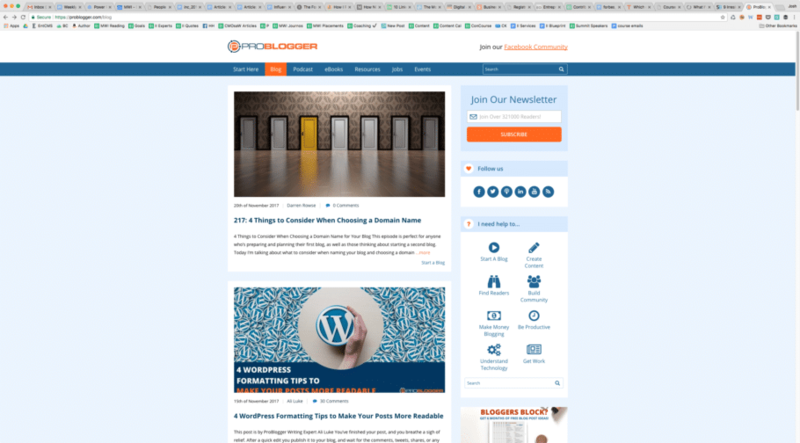 Perhaps you’re here because you just read my post 6 Reasons Contributors Need a Website, which applies not only to those looking to write for top tier business publications but any type of thought leader or influencer. Or maybe you’ve become interested in thought leadership and influence and are mapping out what you need to get started. And it could be that you’re already an established thought leader looking to redesign your website and in search of tips. Regardless, you’re in the right place. Q: Do I have to have a website to be a successful thought leader? A: No, but it sure helps a lot. Q: Does my website really need all of these things to fulfill my objectives as an influencer or thought leader? A: No, these aren’t hard and fast rules–there are exceptions to every one. But if you follow each one you’re likely to have a successful website that helps you, and if you’re going to break the rules you should know them first. Q: What should I start with? A: Start with #1. I’ve put these in rough order of how I would implement them if I were starting from scratch. But if you have a website you may have already implemented several of these, in which case you can scan the list for whatever you’re missing. I use GoDaddy as my registrar. Simple, reputable, and cheap. Short. My marketing agency was able to secure MWI.com back around 2000. It has been a goldmine for us. Short domains are easy to remember and type in, and although with our dependence on search engines this is less of a factor than it once was, it still matters. It’s part of the reason I use JoshSteimle.com as my domain instead of JoshuaSteimle.com. Every little bit counts. Easy to spell when spoken. MWI is a great domain name because it’s so short, but people often think I’m saying “NWI” when I say it. The letters “F” and “S” often get mixed up, and sometimes the same happens with “D” and “T” as well. Easy to say when written. MWI is, thankfully, quite easy to say when written out and read aloud. I can’t say the same for “Steimle,” which people rarely pronounce correctly (hint: the way I say it, it rhymes with “timely”). .com. A dot-com is the default extension. Sure, you can go with .io or .co and other alternatives, but when people forget the extension they’ll type in .com by default. I would avoid .net, .org, or .biz, they either sound/look weird/unprofessional or send confusing messages about your intentions. These are good general rules for domains, but there is one rule that trumps all others–as a thought leader or influencer your domain should be your name, with rare exceptions. Prior to JoshSteimle.com this website used a different name that was easier to say and spell, but it also confused people and led to branding issues. It was hard for me to make the switch, but since making it I have no regrets. Q: What if my name isn’t available as a domain? Q: What if my name is super, super hard to spell or say? A: Then change your name. Perhaps not legally, but use a different form of your name. For example, India’s most famous female athlete’s name is Pilavullakandi Thekkeparambil Usha. She wisely chose to go by PT Usha in public life and registered the domain PTUsha.com. For hosting I don’t have a favorite at the moment. I hear good things about HostGator, but haven’t used them myself. Name. Whether it’s your name or a brand name you’ve created, it needs to be prominent and clear on every page of your website. Logo. Your logo can simply be the name–you don’t need a symbol or “logomark,” but it should be distinctive and consistent across your site. Colors. Choose a color palette that looks professional and is functional. I chose yellow as a highlight color for my website but guess what? 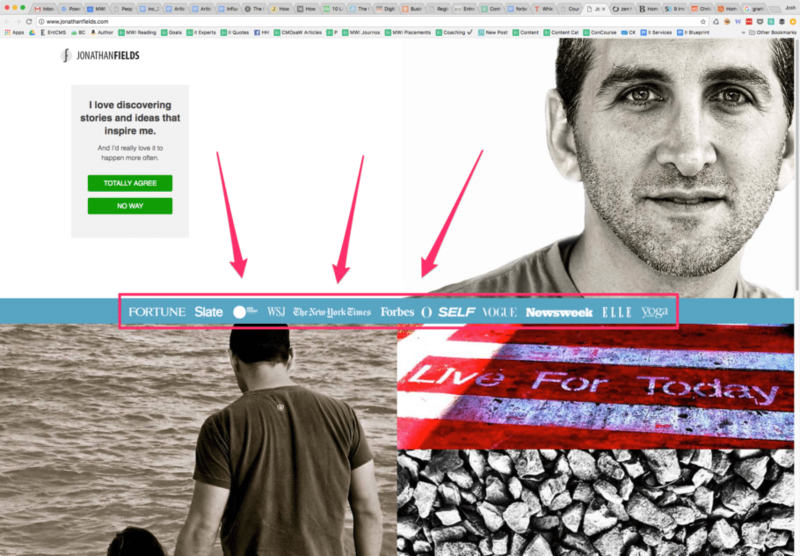 Yellow doesn’t work well for highlighting links on a white background–whoops! There are many websites like this one that go in depth on website color palettes. Font. You should use as few font as possible, and that includes both font types as well as usages of that font (big, small, italics, bold, etc.). And while it should go without saying, never use Times Roman, Papyrus, or Comic Sans. Clean look and feel. All these elements and others below come together to produce a certain look at feel. Some websites don’t have a strong brand and so they look incoherent, as though someone slapped a bunch of information and photos into a Word doc. 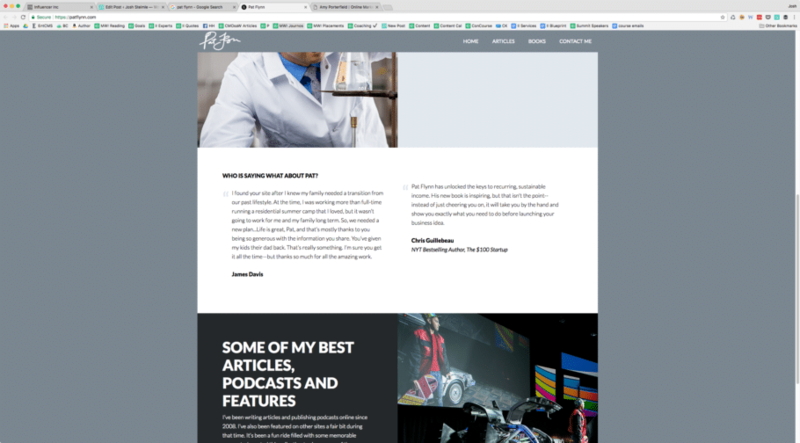 These days you can find free or cheap WordPress templates that are well designed so there’s no excuse for a messy website. Here are samples of websites with good branding, even though they don’t look the same. 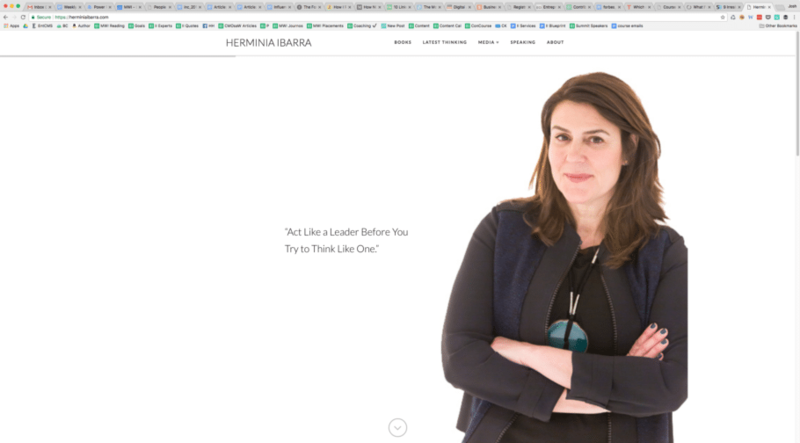 Herminia Ibarra’s website is ultra-clean, utilizing white space. The font she chose for her logo/name is distinctive. Even the clothing she wears in her photo is “on-brand” in that it’s mostly black and matches the black on white design of the rest of the site. 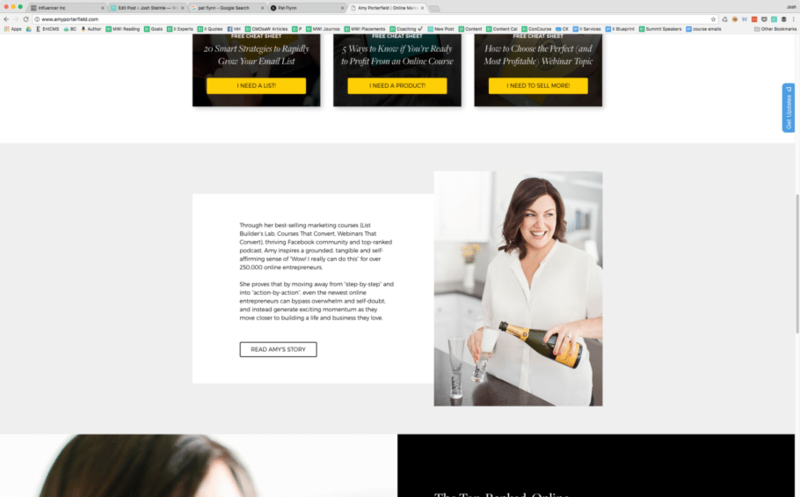 You may look at this website design and think “That’s too simple, anyone could design a site like that.” The opposite is true–amateur designers can’t resist the temptation to crowd a website with design elements that are unnecessary at best, and confusing at worst. It takes a professional to be brave enough to include only what is essential. Grant Baldwin’s website looks nothing like Herminia’s, but it’s still very professional and nice looking. Grant chose to associate a symbol with his name, a logomark, which is fine–it doesn’t detract from the professionalism of his website. 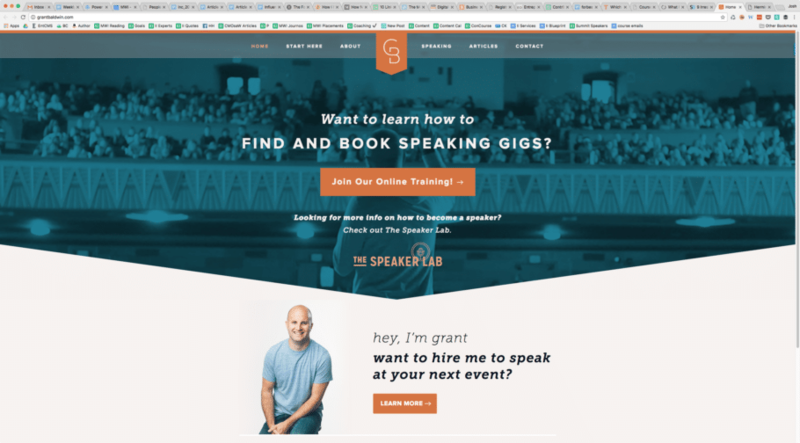 He has an impressive photo of him speaking in front of an audience, which is important since Grant teaches others how to get booked and paid to speak at events, but he also shows his smiling face in a separate photo. Note: Grant is THE guy to learn from when it comes to the business of public speaking. Go to his website and click on that big “Join Our Online Training” link right now. 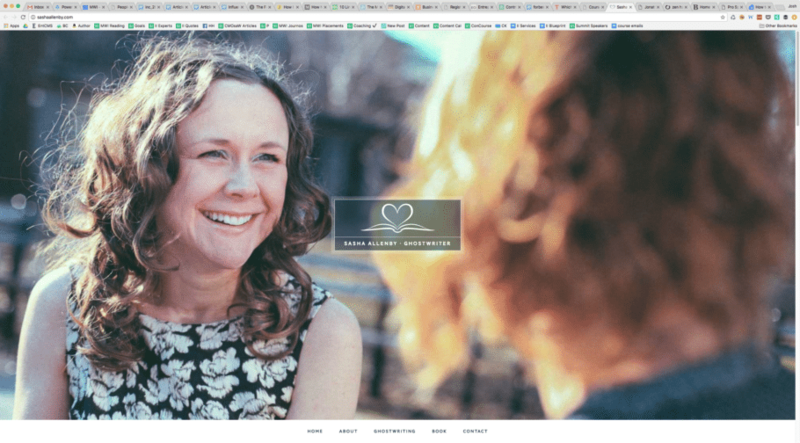 This website is focused on you, and visitors will feel more connected if they can see a photo of your smiling face. If you’re building a speaking career then having a photo of you speaking to a big audience is a plus. Ghostwriter Sasha Allenby has one of the best website homepage photos I’ve seen–it’s natural, authentic, in motion, colorful, warm, inviting. Photos like this don’t happen by accident. 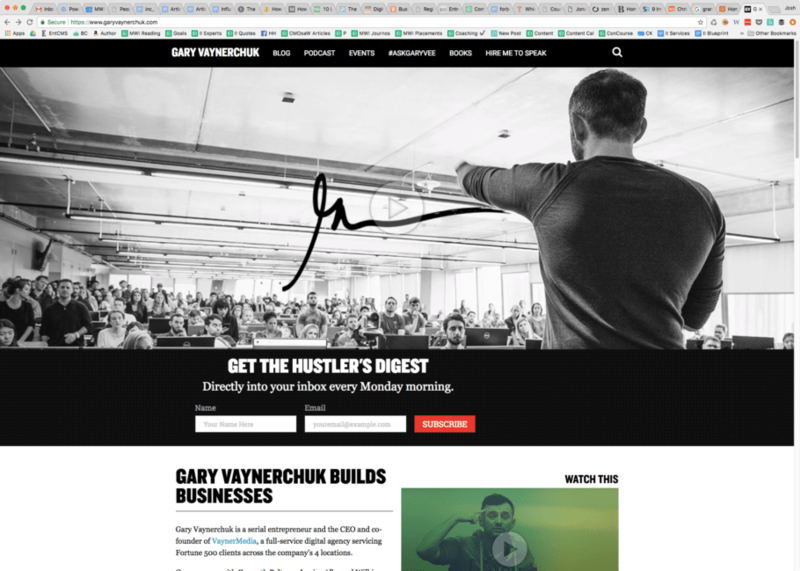 Gary Vaynerchuk‘s photo is also professional, and although it doesn’t show his face his happy mug is plastered everywhere else on the website and his action–speaking and answering questions–fits his brand so it works well. Sun Tzu said that when you’re small you should appear big, and when you’re big you should appear small. Gary Vaynerchuk is big, so he can afford to ignore social proof–he doesn’t need it. People use photos of themselves with him as social proof. For Gary, the game he needs to play is to make himself look more personable and accessible. For the rest of us, we want to show the world what we’ve done in concrete terms so they know we’re not somebody who just decided yesterday to become a thought leader and threw up a website. Social proof for thought leaders generally falls into two categories; 1) showing off media badges, and 2) showing off big clients we’ve worked with. This second one is a special case I wanted to highlight. 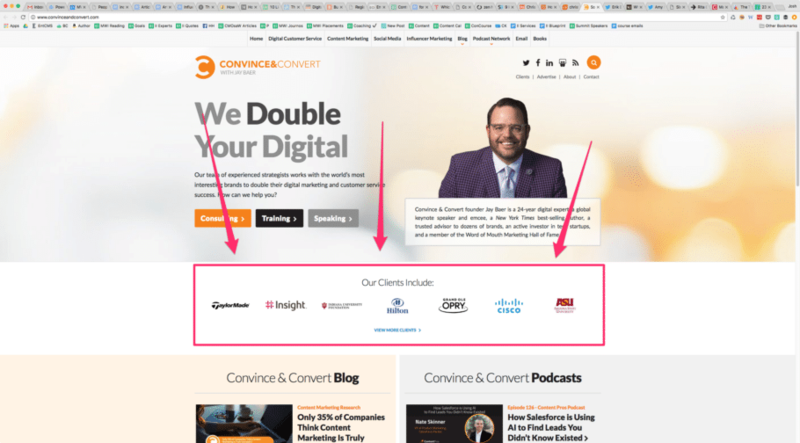 Jay Baer has a personal brand website, but he also uses his personal brand on his Convince and Convert company website where he shows off his clients instead of his media badges. “Oh, this guy has worked with these big companies? 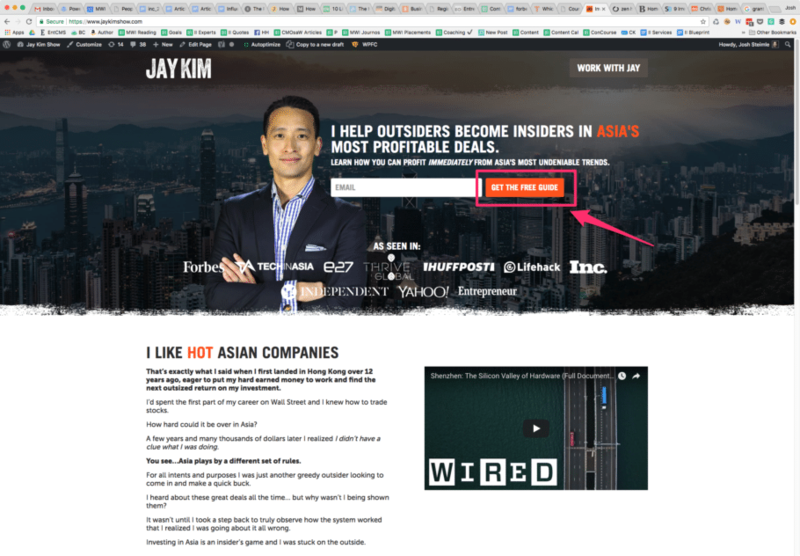 Maybe my company should check him and his company out.” Two side notes here; 1) Jay’s book Youtility is a must-read for all aspiring thought leaders and influencers, and 2) you’ll notice that Jay uses his name on his company website within the logo/brand. I suspect this is because he’s trying to transition his well-established personal brand to his company, which may not be as well known. Books are major credibility, so if you’ve got one, show it off. 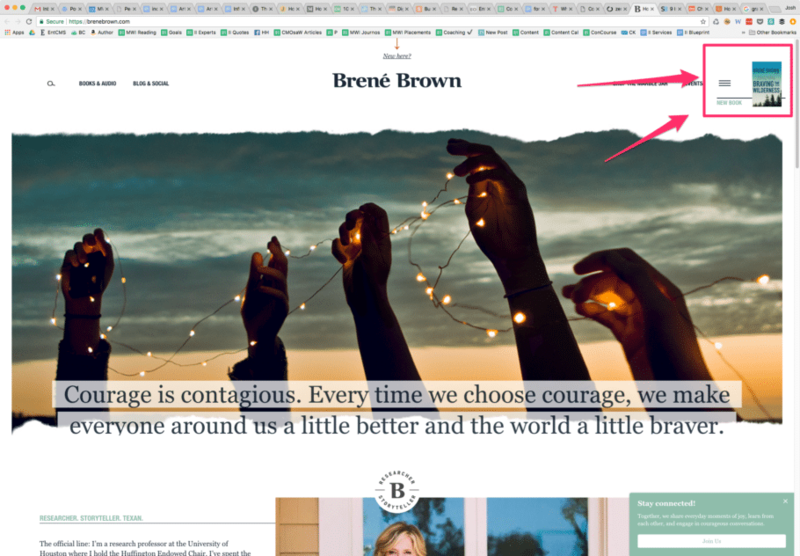 Here’s how Brené Brown does it on her website. You’ll notice Brené doesn’t make the book take center stage. She’s got a lot of other things going on that she wants to talk about, but it’s still there, hanging out in the corner, reminding you that she’s a bestselling author. In the case of the Heath brothers, Dan and Chip, who have opted to create a two-person personal brand, their books are the big driver for everything else they do, so their latest book is right there–bam! In your face, where it should be. 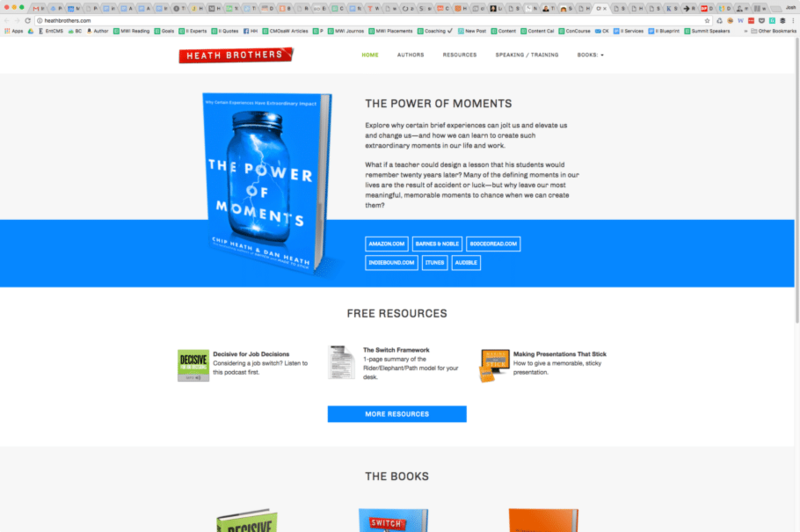 Grant Baldwin, mentioned above, says that for speakers it’s a must-have on your website. It’s still a big plus for everyone else. For one, it’s credibility just to have the option there because not everyone will go to the effort of putting video on their website. For another, a major personal connection starts to develop when someone can watch a video of you speaking. That’s the type of thing that makes people come up to you at events and say “I feel like I know you, even though we’re meeting for the first time!” It’s like “the big photo” times ten. 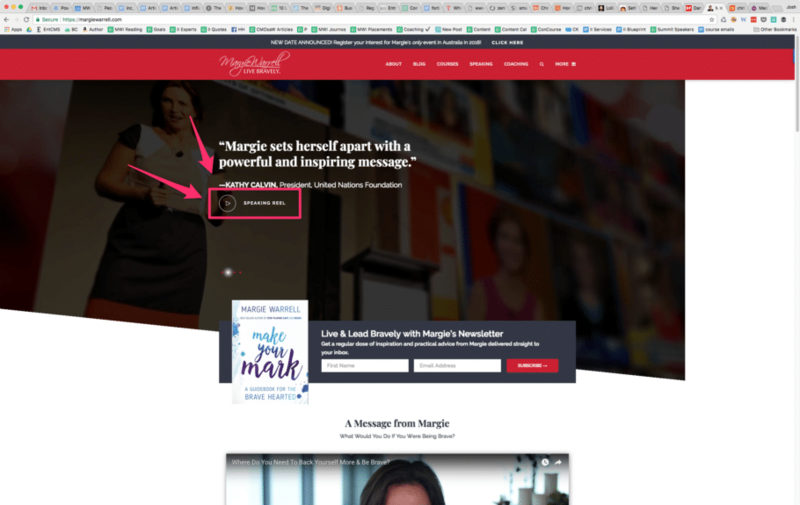 Margie Warrell shows us an effective way to include video on website–put it right there on your homepage where everyone can see it. 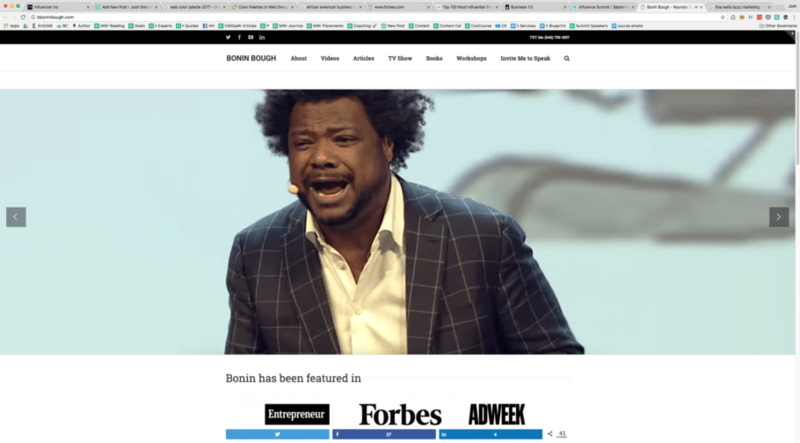 Bonin Bough doesn’t even wait for people to click a link, he has video on auto-play on his homepage, and since the image below is static you’ve got to go check out the video on his homepage for yourself, it’s quite impressive. By the way, I could have gotten a better freeze frame of him, but this one was too good to not use. I’m a big fan of putting your email address everywhere and embracing spam–let Gmail take care of that. 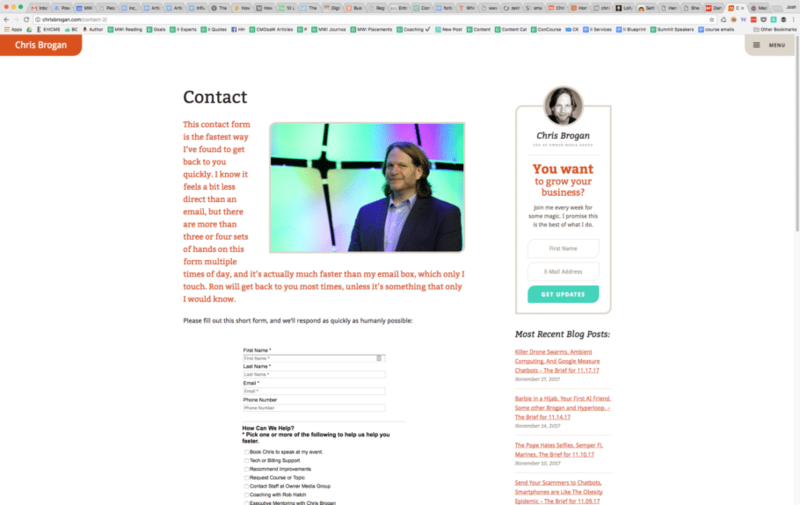 But if you must use a form (hey, even I do for my speaking engagement leads), the way Chris Brogan does it is the way to go. This contact form is the fastest way I’ve found to get back to you quickly. I know it feels a bit less direct than an email, but there are more than three or four sets of hands on this form multiple times of day, and it’s actually much faster than my email box, which only I touch. Ron will get back to you most times, unless it’s something that only I would know. That’s the kind of human touch that makes you want to fill out the form, whereas most forms feel impersonal and make you want to move on. I’m constantly being asked for my photo, which is why I include a link to a high-resolution version of it on my speaker page. Writers want it for their articles, event organizers want it for event promotion. If you don’t provide one, they’ll go on Google image search and find one, and it may not be one you want them to use. 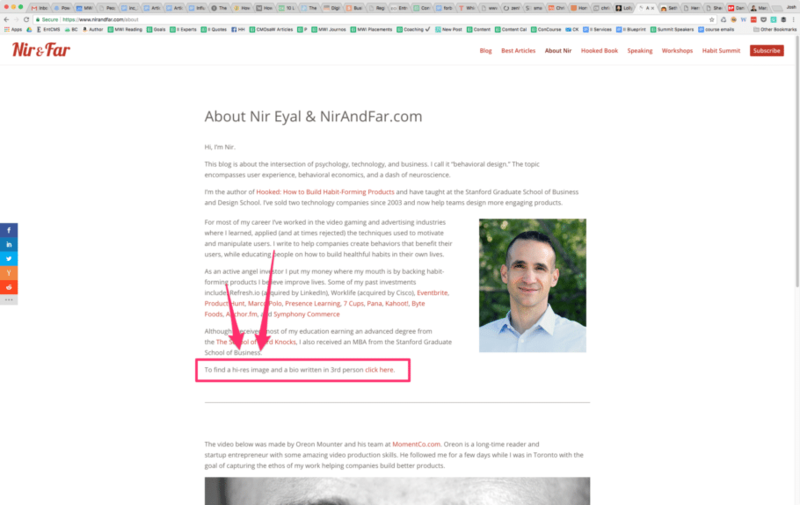 Make it easy, like Nir Eyal does here. Actually, I would say make it even easier to find, perhaps by putting a big button on it, but it was hard enough to find any influencer with a downloadable photo anywhere on their website that I could show as an example. On a website I’m more open to one, the other, or both, although I would never recommend using the word “guru” anywhere on your website to describe yourself. That’s just weird. While we’re on the topic, don’t use “visionary,” “forward thinking,” “innovative,” or anything of that sort, either. Amy Porterfield has a brief bio on her homepage, which then leads to a longer version. 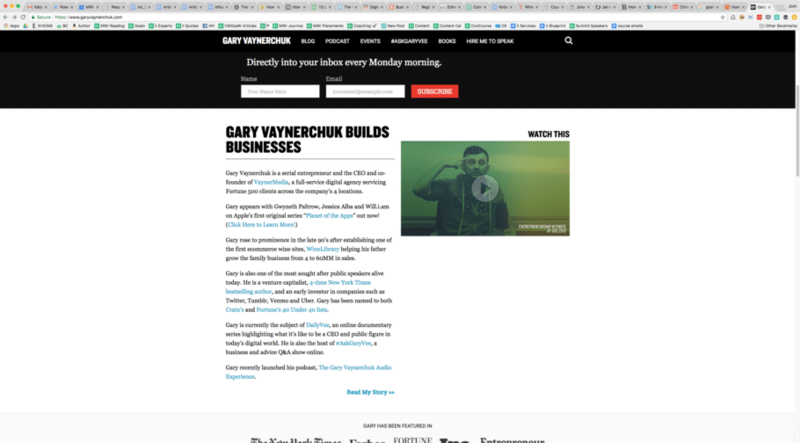 Likewise Gary Vaynerchuk has a bio on his homepage with helpful information and a link to more. Testimonials are great credibility builders. 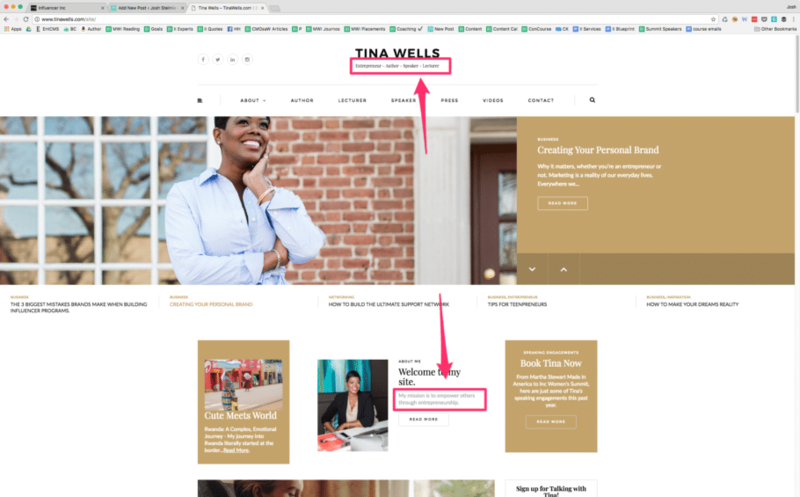 Put them on your homepage, your speaking page, and anywhere else you want your audience to know what others are saying about you. Pat Flynn has two of them on his homepage, displayed prominently about halfway down. For many thought leaders the blog is how they attract an audience in the first place. It’s the content that establishes that your thoughts are worth following. The two biggest mistakes I see on thought leader blogs are that they have a blog but aren’t blogging, or they’re not blogging enough. 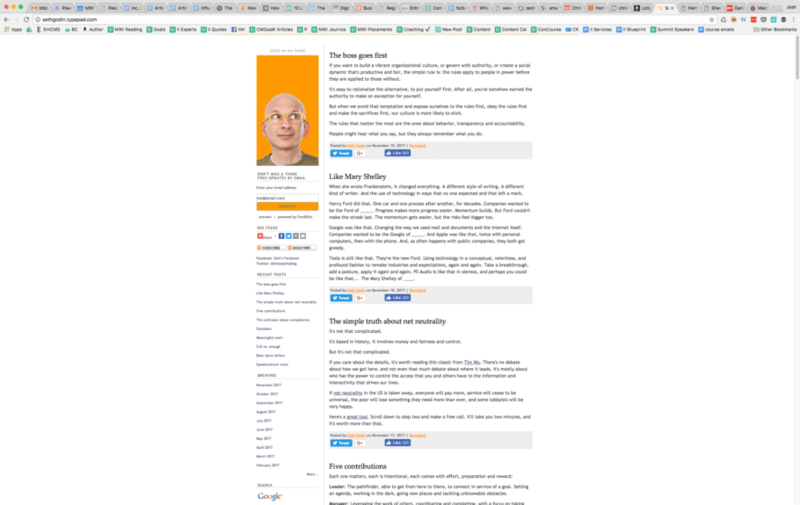 Seth Godin blogs every single day. He keeps it simple, nothing too fancy or lengthy, but always profound. Darren Rowse, whose personal brand is united with his website ProBlogger, blog frequently but also involves others in blogging on his website, so that it’s not just him. Interesting side note about Darren and blogging–on one of his podcasts he told a story about asking his blogger friends where they spent most of their time promoting their content. Social media was where most of them spent their time. Then he asked them where they were getting most of their traffic from. SEO was the overwhelming response. Remember that when thinking about your audience acquisition strategy. In the industry you’ll hear most people call it a CTA, which stands for “call to action,” which is just what it sounds like–you’re asking someone to do something. One of the most common CTAs is to join an email list, which we’ll talk about in a moment. Regardless, if people are coming to your website you want to ask them to do something other than just read stuff, and preferably something that will lead to a longer term, more serious relationship. 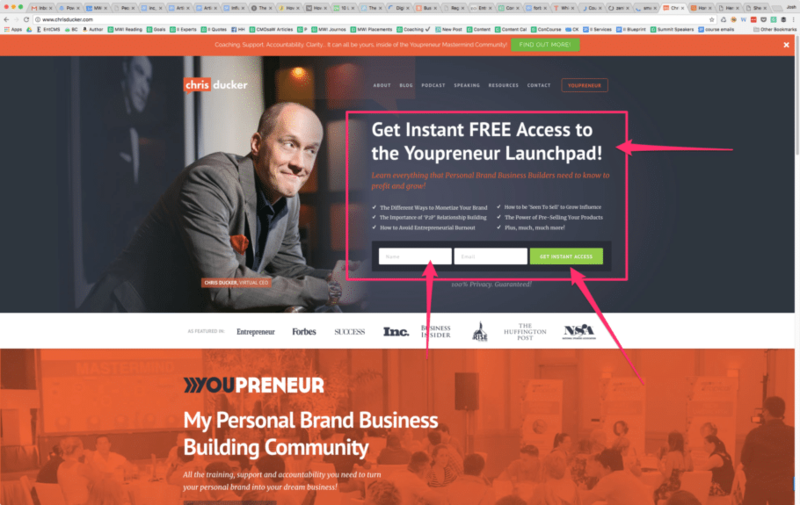 Chris Ducker‘s CTA is to offer you free access to his membership community. For Bryan Harris, it’s to sign up to start receiving tips about how to build your email list. Note: I highly recommend signing up for this–Bryan’s tips are pure gold. For me he’s the go-to guy on email list building. If there’s one regret I have about my website, it’s that I didn’t start building an email list 10 years earlier. Argh!!! Don’t repeat my mistake, folks, go get an account at ConvertKit right now and start building your list. 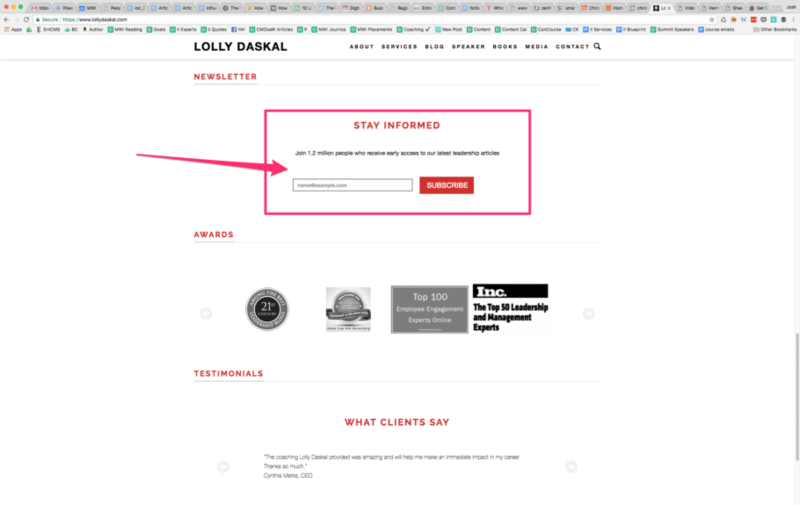 Just keep it simple at first, get a small form on your website, like Lolly Daskal has. 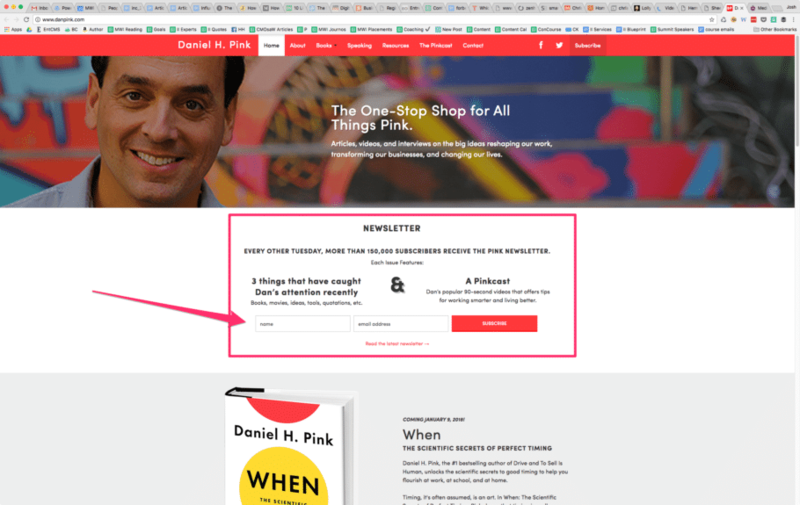 Daniel Pink also knows what’s up, he’s got his form on his website as well. Fewer fields is better. If you ask for a lot of information from people signing up you’ll get fewer signups. A first name and email address are reasonable. Just the email address by itself will increase your signup rate. Anything more than a first name and email address is likely to kill it. Set expectations. I send out daily email, M-F. If people didn’t know that when signing up they’d be unsubscribing just as fast as they signed up. If you’ve got numbers, flaunt them. Dan has 150,000 subscribers, so he shows off that number. I’d say anything over 10,000 is worth showing off, but there’s no hard and fast rule. I’ve seen people show off a lot less. Want to dramatically increase the number of email signups you get? 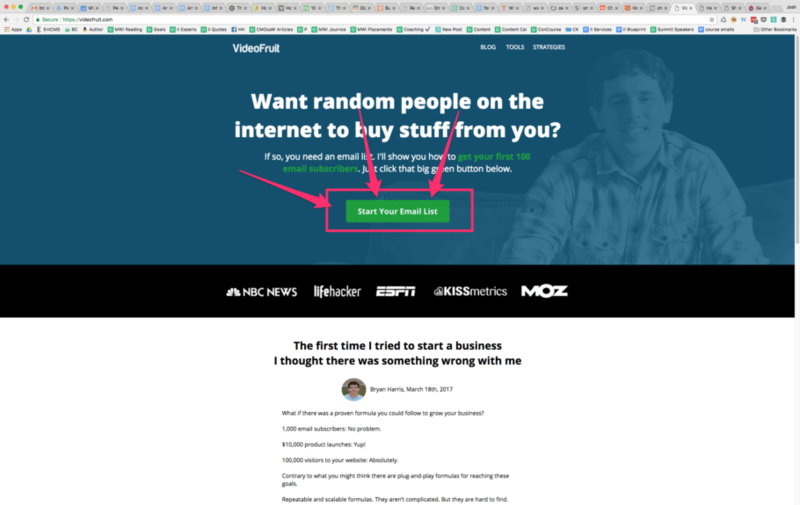 A good lead magnet will automatically double your signup rate, if not triple or quadruple it. A lead magnet is something you give away as an incentive for completing a CTA. “Sign up for my email newsletter and get my latest ebook,” is an example. 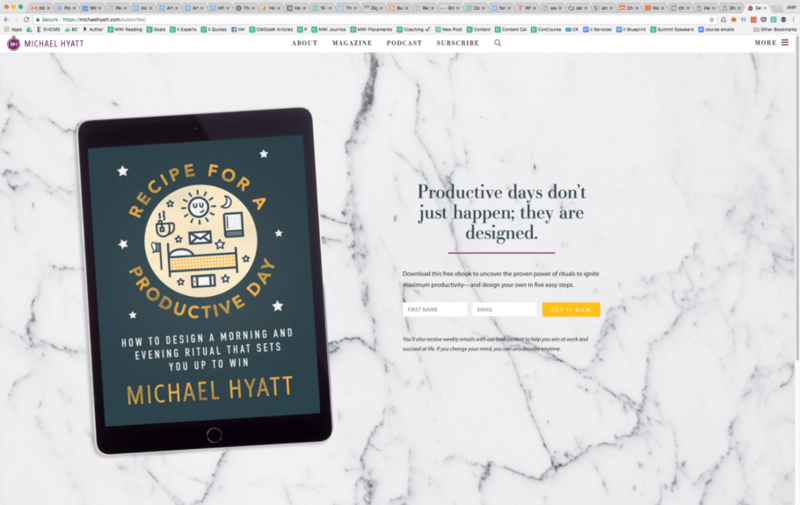 Michael Hyatt has used ebooks as lead magnets for years, and with an email list in the hundreds of thousands they seem to be working well for him. As you can see, many of these thought leaders are hitting a lot of these 15 things, but missing others. Maybe that’s intentional, or perhaps it’s an oversight. I’m still in the process of implementing a few of these myself, or taking full advantage of them. 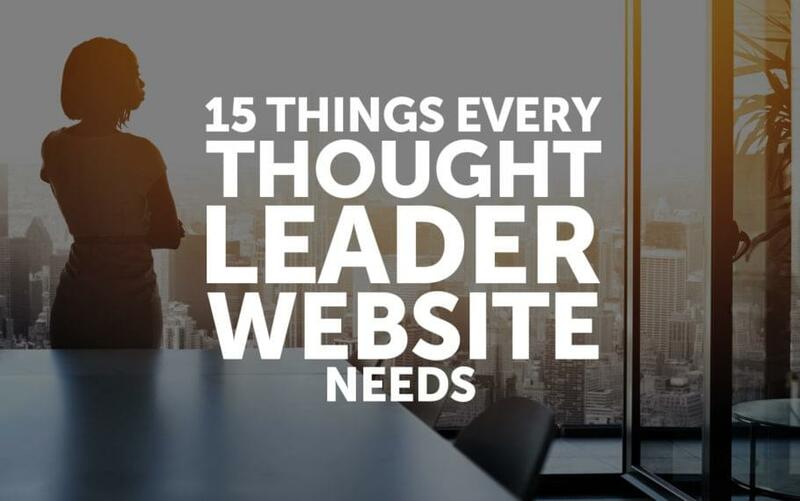 What I know is that they work, and the more of these things you have on your website, the quicker your road to successful thought leadership will be. Is there anything you think I missed? Let me know in the comments below.